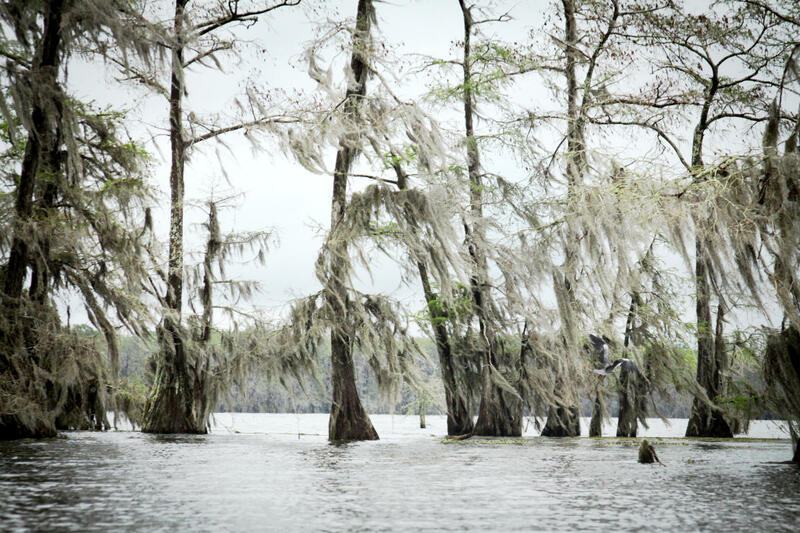 South Louisiana’s waterways provide a gateway to outdoor adventure like no other. Exploration of this region in a kayak or canoe is an unforgettable wilderness experience and offers the perfect opportunity for wildlife spotting, birdwatching, and photography. Spend some time discovering the beauty of bottomland hardwood forests in and around Lafayette! Here are our top five picks for places to paddle in the area:. The Bayou Vermilion winds through Lafayette and Vermilion Parishes, passing through swamps, agricultural lands, and the cities of Lafayette and Abbeville before emptying into the Gulf of Mexico at Vermilion Bay. Several boat launches along the bayou make for an easy day spent on the water. Use the Lafayette Parish Bayou Vermilion District’s interactive paddle trail map to map out your custom trip. It shows locations of launches and various sites of interest along your way. A word of advice-when starting out, head upstream first so the return trip is the easiest paddling! One of the most scenic stretches of the Vermilion and its tributaries is located just minutes from Downtown Lafayette. Use the kayak launch located at Vermilionville Living History and Folklife Park and paddle upstream, following the bayou up and around the Lafayette Airport. After 1.5 miles, you will reach a fork in the channel. The Vermilion continues to the left while the Bayou Tortue branches off to the right. Follow Bayou Tortue for another 1.4 miles, and the narrowing stream will then open up into Lake Charlo. This small lake, ringed with clusters of cypress and tupelo trees, is home to many species of wading birds and raptors common to the area. Alligators are commonly spotted here as well. Spend some time exploring the lake before making your way back to your starting point. Allow at least 3 hours for the round-trip paddle and give yourself additional time if you want to visit Vermilionville. Looking for a bigger adventure? Sign up for Lafayette Travel’s Vermilion Voyage. A three day, 50 mile paddle following the Bayou Vermilion through Lafayette and Vermilion Parishes. This year’s trip will be held March 22-25, 2018. For more information and to reserve your spot, click here. Perhaps the most popular location for canoe and kayak trips in this area is Lake Martin. 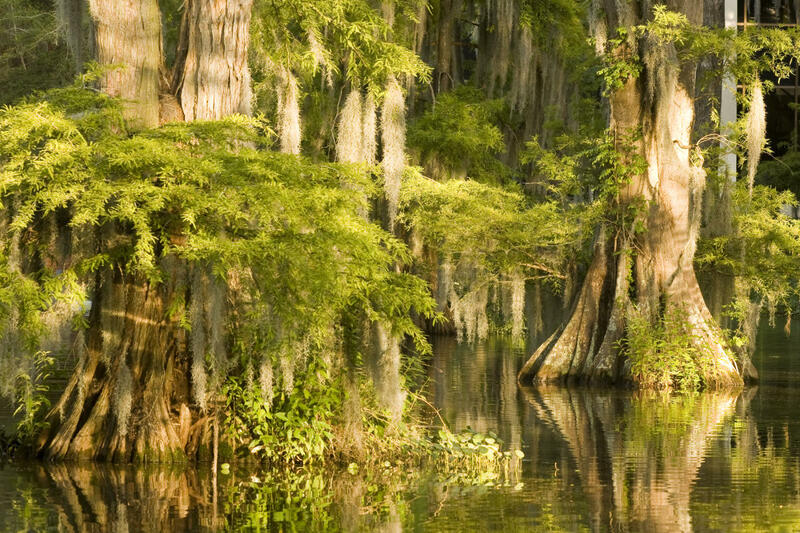 Located about 10 miles from downtown Lafayette, just off of LA Highway 353, it is one of the most accessible and easy to paddle examples of a cypress and tupelo swamp in the area. Follow Rookery Road to the boat launch and start your paddle there. Wind your way through the trees that ring the edges of the lake, keeping an eye out for alligators sunning themselves, and wading birds hunting the shallow waters. Visit early morning or just before sunset when the water is still and the animals are active. Birdwatching is good year round, but is particularly impressive during the Spring when the birds are nesting in the rookery. Note that while boating is always allowed, the rookery itself at the south end of the lake is off limits during the nesting season (Feb 1-July 31.) Allow at least 2-3 hours for paddling, though more time can easily be spent here, especially if you’re interested in birdwatching or photography. The Bayou Teche runs 135 miles through South Louisiana, from Port Barre to Berwick. Along the way, there are 13 established boat launches from which to start your journey. Designated as a National Water Trail by the National Park Service, there are countless possibilities for excursions along the Teche to fit any interest, schedule, or skill level. 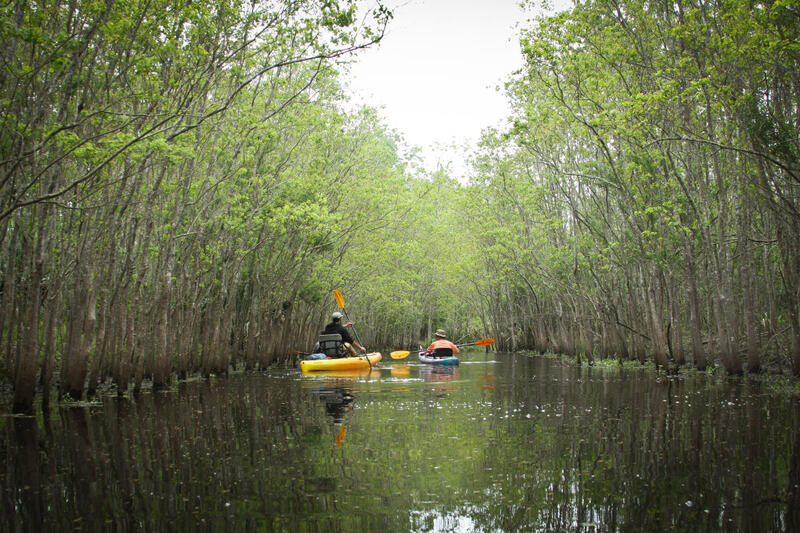 Consider planning your paddle around a town you want to visit- Arnaudville, Breaux Bridge, and St. Martinville are all close to Lafayette and are rich in historic, cultural and natural landmarks that can be accessed on foot from kayak launches. Contact Bayou Teche Experience for shuttle service to customize your trip and maximize your time on the water. Louisiana State Parks are a fantastic resource for outdoor adventures of all kinds. Palmetto Island State Park, located about 30 miles south of Lafayette, has a canoe trail that connects three small ponds and is an easy trip for beginner paddlers. The trail continues to the Vermilion River, giving the opportunity to extend the length of your trip as much as you’d like, depending on your schedule and skill level. Spend the day in the park, or take advantage of their camping and cabin facilities to make it an overnight adventure. Additional options in the area for excellent paddling are Chicot State Park and Lake Fausse Point State Park. All three mentioned state parks offer canoe rentals and established paddle trails, as well as camping areas, cabin rentals, and hiking trails. Lake Fausse Point also has five primitive campsites that are accessible only by boat. The Atchafalaya Basin is the nation’s largest river swamp, and as such can be very difficult to navigate for someone unfamiliar with the area. If you wish to paddle within the basin, it is of utmost important to carry a map and compass, a GPS unit, or both. There are many places within the Basin that are good for paddling, but one of the most convenient to Lafayette is the Indian Bayou public access area, maintained by the US Army Corps of Engineers. 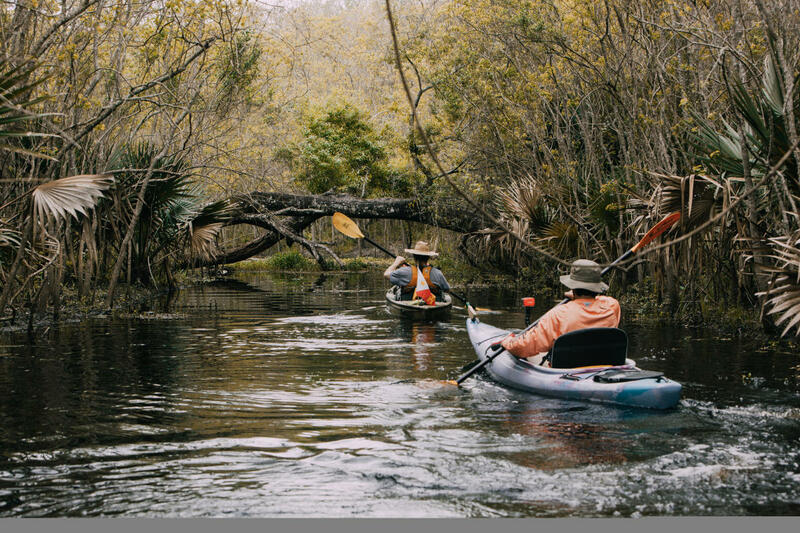 With access points as close as about 20 miles from town, the Indian Bayou area is home to a 24-mile paddle trail network that stretches from US Hwy 190 to Interstate 10. Boaters can make the whole trip by shuttling to the Courtableau Boat Launch (Off US 190 between Port Barre and Krotz Springs) or launch from the closer West Dixie Boat Launch (On N. Henderson Levee Road, approximately 4 miles north of Interstate 10) and follow the canal to join the marked trail network. For maps and GPS points of the trail and boat launches, download brochures here and here. Need to rent a canoe or kayak for your adventure? Here are a few options for getting the gear you need and up to date advice on conditions for your trip. Local outfitter Pack and Paddle offers a variety of kayaks, canoes, and paddle boards available for rent for use within a 60-mile radius, though you must transport the boats yourself. Book online here or call (337) 232-5854 for more information. The Pack and Paddle website is also a great resource for information on additional paddling and hiking locations. 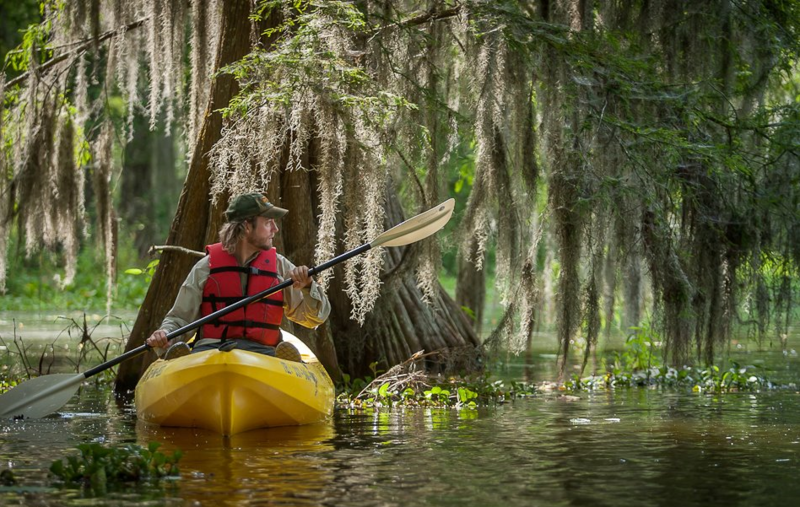 In addition to keeping your Bayou Vermilion clean and maintaining several public boat launches along the river, the Lafayette Parish Bayou Vermilion District also offers beginner, intermediate or advanced canoe or kayak lessons, as well as guided and/or custom paddle trips along the Bayou Vermilion. Call 337-233-4077 or visit their website for information on these services. The website also houses an interactive paddle trail map of the bayou. Conveniently located on the banks of Bayou Teche in downtown Breaux Bridge, Bayou Teche Experience offers kayak rentals as well as shuttle service to local paddling hotspots, including Lake Martin and a variety of points along the Teche. Contact them at 337-366-0337 to set up a custom trip that fits your needs. Located in the Atchafalaya Basin, McGee&apos;s is the only location in the Atchafalaya Swamp that rents canoes and offers unguided paddling trips through the swamp, as well as guided photography workshops. You can find more information about rentals here and guided photography tours here. They also offer swamp tours in tour boats or air boats so you can see all the beauty that is the Atchafalaya. A Lafayette native, Kristie Cornell is an Instructor of Geology at the University of Louisiana at Lafayette. She has traveled extensively throughout Louisiana and across the world, exploring and photographing the often overlooked details of the cultural and physical landscapes that surround her. She can generally be found kayaking, camping, or hiking with her dog, Harper.